"Twinkle Twinkle, Little Star." You've heard it a million times, but do your kids know all the words? Don't worry, Binki Kids is here to help! Our newly launched channel compiles all your favorite kid's songs and nursery rhymes in an entertaining show that will have your child singing along in no time. Enter a world of discovery and delightful education with Eva, a curious baby who's got a lot to learn! 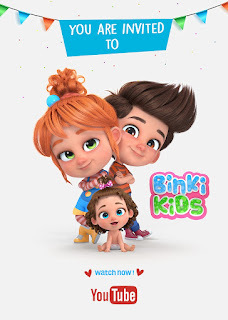 Binki Kids follows baby Eva as her brother, Jack, and sister, Peach, teach her about alphabets, shapes, colors and more. Each episode will take your little one into Eva's room, where a magic wall has a button that can play songs for children. Here, your tot can join in as Jack teaches Eva about the animals, or Peach shows off the dance for "Johnny Johnny Yes Papa." Every new day in Eva's room has a new lesson to learn! Is your family ready to press play on this adventure? Binki Kids uses a system of rhymes and songs to help your child learn and remember lessons about everyday life. Watch as your child masters the ABCs, body parts, and numbers through a variety of fun songs. From favorites like the "Daddy Finger Song" to classics like "The Alphabet Song," Binki Kids will have your whole family singing along! Designed for children between 1 and 7 years old, Binki Kids makes education fun for all ages! Just learning to walk? Enjoy our selection of baby songs! Preschool or kindergarten? Choose an episode focusing on number and alphabet songs for children! Whether we're teaching the "Finger Family" or "The Body Parts Song," there's always something your child can enjoy. Filled with gorgeous imagery and a great attention to detail, Binki Kids is a feast for your child's eyes. With 3D characters and high quality art, Eva's adventures will come to your screen in full, beautiful color. Each episode will deliver not just a set of fun songs, but also a sense of wonder and magic. Here, your child won't just be watching a show; they'll be watching a family. Seeing Peach, Jack, and Eva bonding together with catchy music and lively animations will show your child a healthy, fun example of human relationships. After all, music does have a power to bring us together!